Our organization is engaged in offering an extensive range of Spooling Machine (wire-spooling) which is designed as per DIN standards. It is available in various specifications ranging from 100 mm to 1100 mm bobbins and has weight from 10 kgs. to 100 kgs. Furthermore, our range is to be attached with various wire drawing machine or individual spooling use. Ranging from 100 mm to 1100 mm bobbins as per DIN standards having coil weight from 10 kgs. to 100 kgs. to be attached with various wire drawing machine or individual spooling use. Spooling machine with constant tension motor for wire sizes upto 5 mm and speeds upto 8 m/s for ferrous and non-ferrous wires. •: Spooling machine with constant tension motor for wire sizes upto 1.50 mm and speeds upto 10 m/s for ferrous and non-ferrous wires. Our organization is engaged in offering an extensive range of Wire Spooling Machine, which is designed as per DIN standards. It is available in various specifications ranging from 100 mm to 1100 mm bobbins and has weight from 10 kgs. to 100 kgs. Furthermore, our range is to be attached with various wire drawing machine or individual spooling use. In order to retain remarkable position in this industry, we are providing a wide array of Wire Spooling Machine. Being an eminent organization in the industry, we are involved in providing a premium quality range of Wire Spooling Machine. 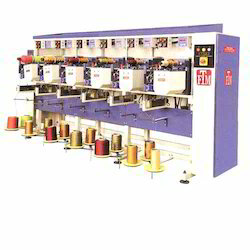 We are an affluent name in the market proffering best array of Super Fine Spooling Machine. They are jerk free in working. 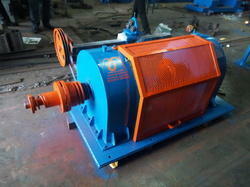 We bring forth for our clients superior quality Wire Spooling Machines. We make use of the finest quality raw material in the manufacturing process adhering to international quality standards. Our clients can avail from us these products at most competitive rates.